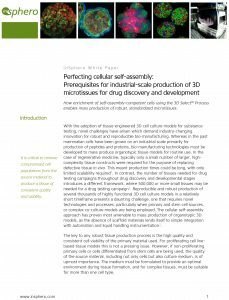 A decade of 3D know-how in every microtissue we produce. The InSphero 3D Select™ Process provides unrivaled physiological relevance in the highest quality, reproducibly manufactured 3D microtissues. Our team of PhD scientists includes experts in engineering fit-for-purpose models using proprietary methods, media formulations, and scaffold-free formats, certified for use in a host of 3D-optimized applications. This lets you fast forward through all the material sourcing, development, production and QC steps, and move forward making faster, more confident decisions about the safety and efficacy of your compounds. You won’t find 3D InSight™ Microtissues anywhere else.